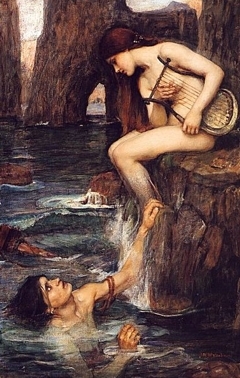 The Siren’s irresistible song, “Here, have what you desire”, influences much of what we do in life. That we ceaselessly want more than we are willing to give is innate animal nature. Modern times have seen an exponential increase in one’s ability to be ‘sucked in’ to desire’s dead end promises. The clever ability to borrow now, pay later is a striking example of that long recognized threat to a balanced existence. Yes, it is much easier now to screw things up than it was in the ancient times of Greek mythology. Seeing this play out in politics is either amusing or depressing, depending on how sincerely I keep my feet on the ground and conform to Nature’s Way rather than what I desire. I recently switched from being a Democrat to an Independent. To say I’m independent is a stretch however. I’m not left, right, or even in the middle… I’m ‘taoist’. The political shenanigans I see have much in common with children bickering on the playground. Partisans on each side scapegoat the other, completely blinded by their own desire and ensuing hypocrisy. To be a full-fledged supporter of one side, one can’t help but vigorously avoid any attempt to view the other side’s case impartially. Indeed, each seems to do all it can to misunderstand the other. That is the natural result of self interest plus tribalism. Even if political leadership wanted to be balanced and honest, they couldn’t without being branded as heretics and expunged. Are Independents the Hope for Effective Democracy? A growing percentage of the electorate is leaving both parties and becoming “independents”. I suspect these folks are not actually joining an ‘Independent Party’, but just becoming more independent in their voting. The population is aging; we are growing up and becoming a more mature population. For me, this translates to an increasingly less politically naive electorate. An older and more experienced population should be able to spot empty promises better than a younger population. Four years ago, I just couldn’t understand how the powers-that-be could be pushing through health-care in the midst of a broken tax system, mortgages underwater, a plunging job market, skyrocketing debt. To top that, one side pushed through their sweeping health reform bill without strong consensus in the body politic. ‘My way or the highway’ can work for petty little issues, but taking such an approach for big issues is the surefire path to civil war. (Indeed, at times it feel we are headed that way.) In the ensuing turmoil, I’d hear the Democrats say the failure to reach across the aisle was the Republicans’ fault. Predictably, the Republicans said the same thing about the Democrats. Who is right? All I can say is that the side that has the majority in both houses and the presidency holds all the cards and is the ‘larger’ entity. The Taoist view is very clear who is responsible for not finding middle ground: For this reason, the larger, using the lower position, normally takes in the smaller. The arrogant and euphoric-high of power that the larger commonly feels (and wields) makes using the lower position profoundly difficult. Such, magnanimity requires the highest level of mature leadership. Sadly that is usually lacking. Had Obama been some 20+ years older when elected, I think his approach would have been more, well, ‘taoist’. As chapter 65 puts it, Of ancients adept in the way, none ever use it to enlighten people, They will use it in order to fool them. As it is, he actually believes his own story, and his ability to ‘enlighten people’ (1). Naturally, that goes hand in hand with youth. To be ‘adept in the way’ takes a lifetime. Like anything else, life is a learning experience taking place over one’s life time. I think the minimum age for being President is 35; they should raise it to at least 65! Yes, that’s no guarantee, but it could help. The third I call not daring to act before all below heaven. On the Iraq War Resolution: Despite some opposition, there was strong consensus for the going to war (2)… 40% of the Democratic Representatives, and 60% of Democratic Senators voted for the resolution. About half of the Democratic side of the aisle supported President Bush along with nearly all those in his party. Imagine how much more divisive it would have been if Bush had pushed through the war with zero Democratic support. Major changes demand strong consensus. If that is lacking, the only wise thing to do is scale back, postpone, or cancel the planned change. On the Health Care Reform Act: The House bill drew the votes of 219 Democrats. Opposed were 176 Republicans and 39 Democrats… 220 to 215 so it just squeaked by. On the Senate side, all 60 Democrats voted for it, and as I recall, no Republicans voted for it… Again, just squeaking by. Thus, there was a complete lack of consensus. Even 22% of Democrats vote against it. That total lack of consensus is simply incompetent governance for a democracy; although it’s perfect governance for an autocracy. Generally my sympathies lie more with the Democratic view of things. I’ve always thought we should have a more publicly funded health-care system like the rest of the world. In other circumstances, I would have supported the reform whole-heartedly; although never if that meant pushing it down the throats of half the country. What I may want personally pales in comparison to the crucial need for consensus in a democracy. A democracy requires maturity; somehow ours has come to be in short supply. Why? Facing the truth, or rather impartially considering the present facts as they are known, doesn’t mean we must actually give up our heart, our feeling, our emotional biases. However, that is what facing the facts impartially will instinctively feel like! Any attempt to consider the other side feels treasonous, and so we stick our heads in the sand and dream on. Allowing our emotional biases to call the shots only works short-term. For me, getting as close to balance as possible is the only thing that works, long-term. The closer I come to that, the more moment to moment well-being I feel. Thought is the real culprit that knocks me off balance in this bottom-line of life. Realizing I don’t know allows me to nip my teetering in the bud. I simply challenge anything I realize I am favoring or thinking to be true at the moment. Preferences are my ‘canary in the coal mine’. It is ‘easy to know‘ them, hear them, head them, and rigorously seek out the other side. Okay, maybe it’s not easy, but what is my alternative? (1) Believing one’s own story is part of it, and a trap of which we all struggle over our lifetime to free ourselves. Additionally, I sense that Obama, like most of us, may lack the temperament to be an effective President. Over the last few years, I’ve heard anecdotal evidence (even from Obama himself) of his difficulty dealing with certain aspects of politics. Still, realizing I don’t know, I tend to give him the benefit of doubt. That changed somewhat after seeing the three Presidential debates. Obama was very passive at the first and rather aggressive at the other two—he was either yin or yang. That indicates to me that Obama would have difficulty reaching across the aisle. Consensus building leadership requires an ability to suspend your agenda and see the ‘big picture’ impartially—a middle ground approach between yin and yang.